The 24-Hour Mommy: And I'm Back! This was taken at Bluewater Maribago Beach Resort in Mactan Island where we spent our last day. I think the three of us enjoyed our vacation so much because we all needed the short break from work and school. We did a lot of eating, visiting places, swimming, and eating... haha! There are just so many foodie places in Cebu! Anyway, I'll be writing more about our trip in the coming days. In the meantime, you can see the rest of our vacation photos in the slideshow below. It looks really peaceful on that hammock. :) Seems like you had an awesome vacation! WOW! you looked so relaxed in that photo, Mauie. How's your vacation???? 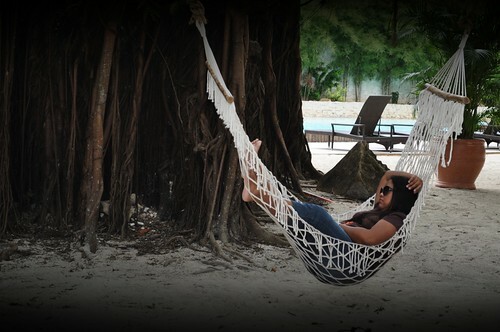 A nap in a hammock under the big tree is priceless! Kainggit. Na-vacation overdose yata ako. HIrap bumalik sa trabaho, hahaha! Kakatamad!